Kids like me were born of the 50's. Our baby-boomer parents were among the first to have televisions in their homes, they cowered beneath their desks during air-raid drills, and later, bore witness to a televised war that severely divided our nation. Our parents had passion. They protested what they thought was wrong. They fought against a system of authority that made life choices for them that ended terribly for many. They knew what "children" were capable of. This is why, in the late 70's and early 80's, when the baby boomers started to have their own children, we began to see films with strong, industrious, smart, capable children working together to "save the day". There's this sentiment floating around my friend group - this nostalgia - "they don't make 'em like they used to - and they used to make 'em great!" And it's true that The Goonies have given way to "Harry Potter" and "Twilight". Still children grappling with - often times - very adult problems. But the look, the feel, and certainly the dialogue reflects a current time that is significantly different from our own childhood. Among the great contributors to this gene of "Kid's adventure films" was Spielberg (a baby boomer himself.) His master plan, create true "family films." Stories that spoke to both children and the adults with them. Shooting scenes from a height that would mimic a child's perspective, making children his "main characters", and creating situations in which children did what came naturally to them. 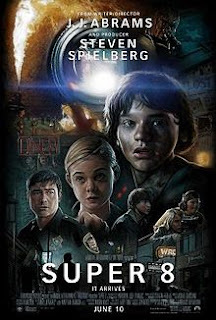 When I first read about "Super 8" I thought, "Fantastic. Another crappy, pretentious scifi flick." My greatest fear? That we'd have to endure (yet another) in a rapidly growing string of alien invasion movies... populated by aliens that all look the same. I seriously feel like I haven't seen an original looking creature since, well, "Alien". Tonight we went to see it. And I have to say, they made it like they used to. Mixing bits of everything that made our favorite 80's kid-flicks great and building from an obviously solid foundation in the history of the scifi genre, Abrams and Spielberg have created a nearly perfect family film. And, thank god, they came up with a creature we could appreciate... especially those of us with a healthy love for John Carter. I'm fairly certain that I've now given away enough of the movie and will stop before completely ruining it for the rest of you.